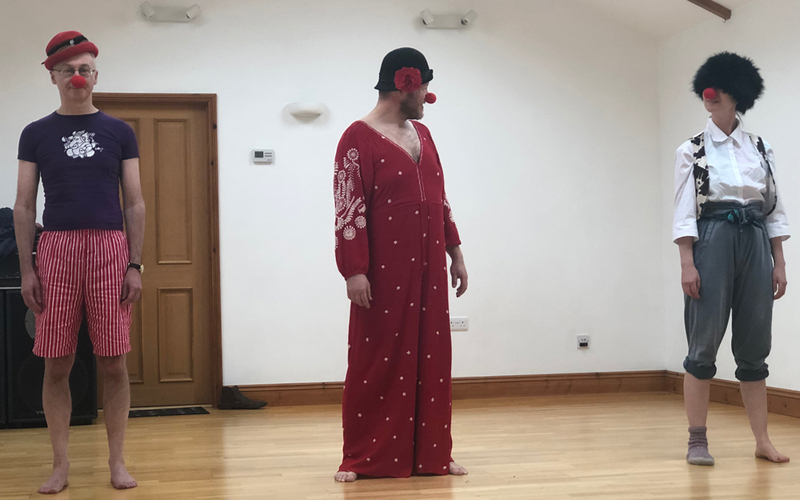 As you may be aware, several members of the Shakti Tantra team recently embarked on a little adventure to find our inner clowns. But what, beyond the coulrophobia (clown fear) inducing American red Bozo character really is a clown and how and why is it relevant to the practice of tantra? And why, by the way, does it really induce such fear? The origin of the world clown is thought to be a Scandinavian word meaning clumsy. Much less sophisticated and entangled with the worlds of politics and power than the jester, the clown is a rustic fool, a know nothing bumpkin idiot. The comedy of the clown therefore is a comedy of the fool whose every day actions through sublime failure become extraordinary and heightened to the point of the ridiculous. Perhaps that is why we are afraid of the clown. It reminds us of ourselves at our most raw, our most unknowing, and least sophisticated. Although the history of the clown and this type of comedy reaches back much further than the word clown, so far back indeed that it is thought to be an intrinsic part of our human condition and is often connected to the sacred and our connection to the divine. Sometimes I think, at the end of the day, tantra is just about getting naked, literally (most probably) but also metaphorically. For me anyway tantra has been a slow unravelling, a shedding of the veils that keep me hidden and safe but that also keep me limited and small. But getting naked is also, we discover, the journey of the clown. In order to find our clown we must strip down to our raw being, casting off everything that is not our true honest and authentic self. And more than this in a way that is incredibly intimate we allow ourselves to be seen. And frankly laughed at. We started this course in a simple way by learning some movements and then showing them to each other. We were aiming for perfection and seriously not reaching it. We knew we were not reaching perfection or even ‘doing it right’ but were taught that we must defend our version of the movement no matter what. No shrugging or laughing, no knowing self-depreciation or smirking coolness. They say that time of the deepest vulnerability is when you are learning. In order to learn anything you have let go of the old and step into the new. At these times you are like a peeler crab who has cast off it’s old shell but who’s new shell has yet to harden. In this case unlike peeler crabs we were not allowed to cower under a rock until we were ready to emerge with our polished skills and hard shells in place but must do this vulnerable thing in front of each other. and everyone was finding it hilarious. Isn’t one of the oldest fears in all of us, the fear of being laughed at? According to Genesis before Adam and Eve ate the allegorical apple Adam walked with God every day. One day God called to Adam but Adam did not come. It turned out he was too shy because ‘post apple’ he now realised he was naked. In this way self-consciousness keeps us from being present with the divine. To me, that means self-consciousness and it’s mean cousins, shyness and shame, keep us from being in the moment, childlike, spontaneous connected and free. From the first time in our early childhood we were laughed at for not ‘getting it right’ we have been covering up our nakedness. But there is a part of us that has not been shaped by a fear of failure, a part that is always getting it wrong and that part is truly innocent. And it is still inside us. That part is the fool. That part is the clown. Alongside this we had to learn to accept the audience. To allow ourselves to be seen. This was a special moment. You can actually feel when you are truly seen, the experience of allowing the regard of others was for me at least a physical sensation, a popping opening of the heart chakra that left me feeling vulnerable and expansive and oddly at peace. ‘Yes I am here’ a quiet voice seemed to say. The final step after finding clothes that accentuated our bodies unique ridiculousness was to allow people to meet our clown. We had to enter the room. Just that. Enter the room and merely allow our clown to be there. What I learnt when I stepped into that room, without thought, without a plan, utterly exposed, completely myself is that even if I do everything wrong, fail in every possible way…..everything’s gonna be alright. In fact it might even be joyful. How would that freedom feel? If we learn to love splashing about in the waters of our own ridiculousness. After we have faced this fear what else can hold us back? Who can we not be? The Rose and the Thorn The gift of stillness – Don’t just do something, sit there!